These small independent retailers often bottled their own casks for example the tremendous George Strachan Rosebank which I reviewed last year. This tradition has dwindled as have their numbers in general. Thankfully Luvians continues to this day often bottling something to celebrate the Open being held at nearby St Andrews. They have a store in the home of golf and also on Cupar high street. For the 2015 Open they pulled out all the stops to bottle a 21 year old Springbank at £500 a bottle but for this review we're going back a decade to 2005 when they bottled this special release. Needless to say Luvians it seems has a good relationship with Springbank distillery. Nose: a varied presentation with olives, copper and sticky toffee. Then the characteristic strawberries I seem to always lock onto with these cask strength Springbank's then oddly a touch of bleach; that caustic element. Returning the faint aroma of roasted coffee beans perhaps due to the maltings and a well worn leather belt. 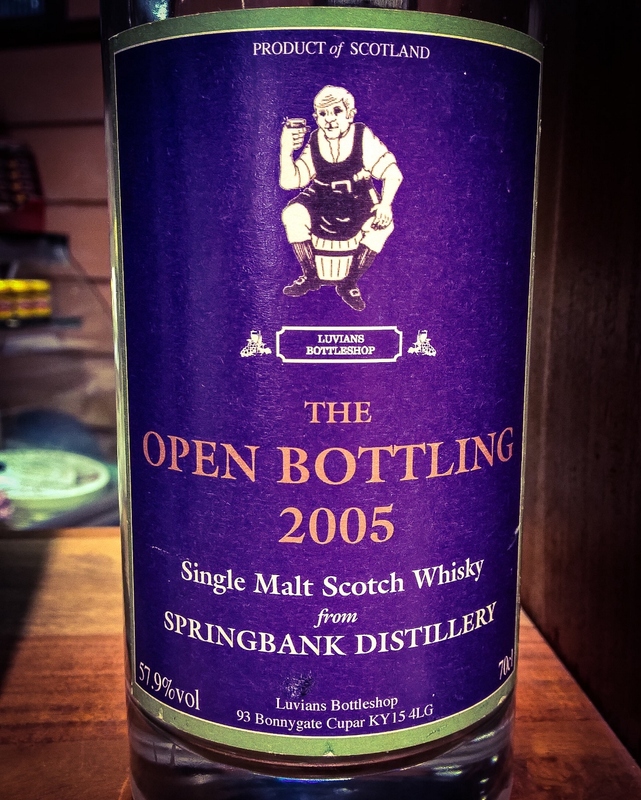 A very solid Springbank bottling and in 2015 it reminds me of the Cadenhead 1824 living cask range which I've on countless occasions over the past couple of years as you'll see here.